1838 - Samuel Cunard granted the transatlantic mail delivery and, with George Burns and David MacIver, created the British and North American Royal Mail Steam Packet Company. 1841 - Britannia launched. 1848 - Samuel Cunard and family moved permanently to London. 1850 - Edward Collins started up the New York and Liverpool United States Mail Steamship Company (Collins Line) in direct competition. 1854 - Admiralty requisitioned 11 Cunard ships during the Crimean War as stipulated in the mail contract. 1858 - Collins Line collapsed. 1859 - Samuel Cunard knighted. 1874 - Bothnia is the first Atlantic liner to introduce a lounge for women, the first library at sea and a bell system for summoning cabin staff. 1876 - mail contracts expired, forcing a reorganisation, concentrating on passenger travel. 1878 - company went public. 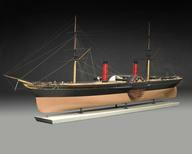 1881 - first Atlantic passenger ship with electric lighting launched. 1884 - Umbria and Etruria, first liners to introduce refrigeration allowing for the removal of livestock from liners. 1893 - first twin-screw Cunarders - Campania and Laconia. 1901 - first Marconi wireless set and operator aboard a Cunard ship. 1902 - JP Morgan failed attempt to buy the company. 1903 - government agreement stipulated that the company should remain entirely under British control. 1905 - Carminia fitted with a Parsons Turbine rather than the standard reciprocating engines. 1912 - Carpathia rescues 704 Titanic survivors. Merger with the Anchor Line. 1914 - Mauretania and Aquitania requisitioned for use during the First World War. 1915 - Lusitania sunk by a German torpedo. 1916 - acquired the Commonwealth and Dominion Line. 1919 - compensated by the British Government for the loss of 22 ships during the war. 1922 - pioneered the Around the World Cruise. 1930 - Sir Percy Elly Bates became chairman. 1934 - merged with White Star Line to form Cunard-White Star. 1936 - Queen Mary's maiden voyage beset by worst storms in living memory, causing injuries to passengers and unsecured furniture. 1938 - Queen Elizabeth launched. 1939 - ships requisitioned by the Admiralty for the war effort. 1940 - Lancastria bombed by Luftwaffe while at anchor off St. Nazaire with the loss of 2,000 lives. 1942 - Laconia torpedoed and sunk by German U-boat U-156. 1947 - company purchased the remaining White Star holding in the company. 1957 - air travel across the Atlantic carried more passengers than ships for the first time. 1959 - acquired Eagle Airways Ltd to take advantage of the increase in air passengers. 1962 - formed a joint venture with British Overseas Airways Corporation (BOAC) to form BOAC-Cunard. 1963 - British Government agreed to loan the company £17.6m to build the QE2. 1966 - change of company focus from passenger travel to resort style floating hotel, implemented. 1966 - BOAC bought out the company's shares in BOAC-Cunard. 1967 - Queen Mary sold and moored at Long Beach, California as a conference and tourist centre. 1969 - maiden voyage of the QE2 to New York. 1971 - Cunard sold to Trafalgar House Investments Ltd ending 132 years of private ownership. 1972 - while being converted into a floating university in Hong Kong, the Queen Elizabeth 1 caught fire, resulting in her being scrapped. 1982 - ships requisitioned for the Falklands War. 1983 - Trafalgar House acquired Norwegian America Line. 1986 - took over the running of Norwegian company, Sea Goddess Cruises. 1990 - Cunard Princess chartered by the United States military to serve in the First Gulf War. 1994 - purchased the Royal Viking Line. 1996 - Trafalgar House Investments Ltd sold to Norwegian company Kvaerner. 1998 - acquired by the Carnival Corporation. 2000 - work commenced on the building of the Queen Mary 2 at French shipyard Chantiers de l'Atlantique. 2004 - Queen Mary 2 launched. 2007 - announced the retirement of the QE2 from service and sale to Istithmar for use as a floating hotel in Dubai.